I am completely smitten with my ice cream maker. Hubby and I purchased it on a whim while strolling through warehouse store Costco a couple of months back and now I'm wondering how I went so long without one. Making ice cream is fun and I can see that the flavor possibilities are vast. I have now officially covered the basics with my maker by churning, decadent chocolate ice cream, brown sugar vanilla ice cream and now fresh strawberry ice cream. I think I'm starting to get a hang of this ice cream thing. The typical ice cream base includes milk, heavy cream, and sugar that are cooked together until hot and then are slowly incorporated with egg yolks to make a custard. This cooks until thickened (and reaches about 175 degrees on a candy or instant read thermometer). Various flavors can be incorporated during the process depending on your recipe. The mixture is usually cooled for a few hours and then comes the churning. If you want to add more flavor via mix ins (like crushed oreos or chocolate chips) they can be added during the last minutes of churning. Mix ins are next on my ice cream journey! My ice cream maker takes from 25 to 35 minutes to do it's magic. The magic frozen custard goes into the freezer for a few hours of freezing time and then your homemade treat is ready to be enjoyed! The steps are easy, but ice cream most definitely requires patience and planning. Something I have learned the hard way! You can get an ice cream maker for a pretty low price (we paid $30 for our Cuisinart 1 1/2 quart maker at Costco). Oh, the other thing you have to remember is to have the bowl for the ice cream maker frozen for at least 6 hours or overnight. We just keep the cleaned bowl in the freezer and cover it with plastic wrap so it's always ready to indulge our ice cream whims! 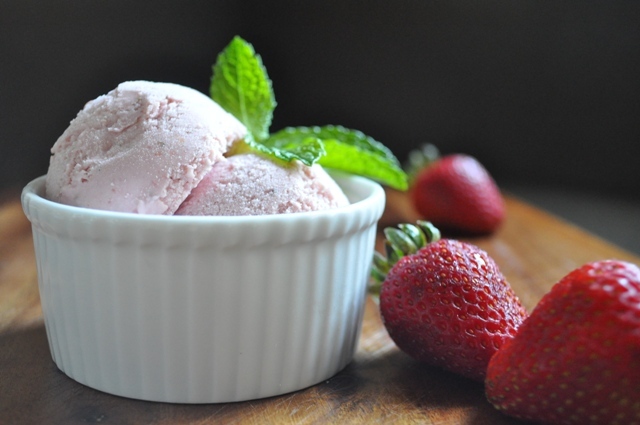 I've had strawberry ice cream on my mind ever since I saw it over on Tracey's Culinary Adventures a couple of weeks ago. I adore strawberry ice cream. It definitely ranks in my top five ice cream flavors. 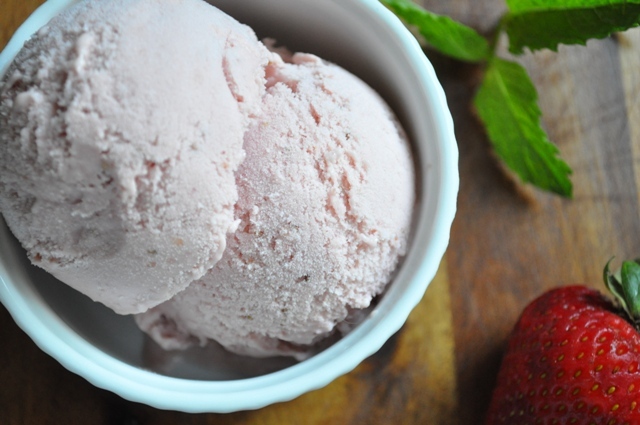 And this homemade version is creamy and sweet and bright with fresh strawberry flavor. I've been savoring it every night after dinner this week to get my sweet fix. Yum. The original recipe Tracey posted called for pureeing only half the chopped strawberries (1 cup) and saving the other half to mix into the ice cream during the last few minutes of churning. Tracey noted that the strawberry pieces get very "firm" in the freezer. I decided to go with a smooth version of the ice cream and I pureed all the strawberries adding it after the custard cooked. 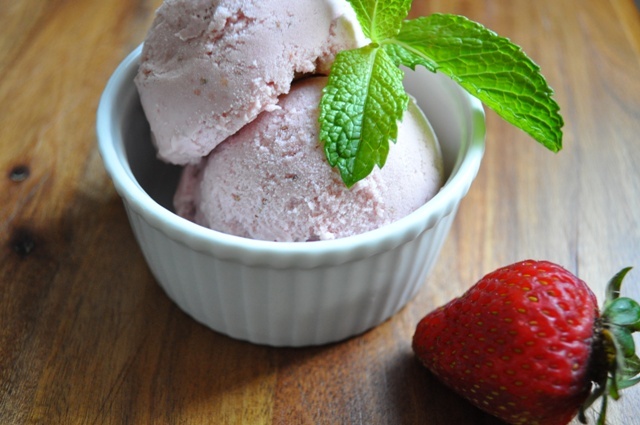 If you want more texture in your ice cream, save out 1 cup of the strawberries and add them in to your ice cream in the final minutes of churning. If you don't have access to fresh strawberries, you could easily use frozen and thaw them out. Add strawberries and 2 tablespoons of sugar to a food processor and puree until smooth and set aside. Whisk egg yolks in a medium heat proof bowl with 1/4 cup of the heavy cream until pale yellow. Combine remaining 3/4 cup of heavy cream, milk and 1/2 cup of sugar in a medium saucepan. Cook mixture on medium heat while stirring constantly with a wooden spoon until it is hot but not boiling. Slowly stream in the hot milk and cream mixture into the egg mixture, whisking continuously until fully incorporated. (You want to add it in slowly while whisking vigorously to prevent the eggs from scrambling from the hot liquid). Return the mixture to the saucepan and continue cooking until the custard has slightly thickened enough to coat the back of a wooden spoon and reaches about 175 degrees on a candy or instant read thermometer. Remove the custard from the heat and stir in the strawberry puree and vanilla extract. Pour the mixture through a fine mesh sieve or strainer and into a medium sized heat proof bowl. Once custard cools slightly (I waited about 15 minutes), cover it with plastic wrap and chill in the refrigerator for about 3 hours or until well chilled throughout. Pour chilled custard into your ice cream maker and churn according to the manufacturer's directions. Transfer ice cream to a freezer proof resealable container and freeze for at least 3 hours or overnight before serving. The ice cream looks splendid, Gloria! Making strawberry ice cream has been on my to-do list for a while, but for some reason I haven't gotten around to it. My husband doesn't like fruit ice cream as much as chocolate or vanilla-based ones and I fear I would eat it all! Tracey posted a strawberry dacquiri one recently, too, that looked amazingly good. If I made this again I would definitely try it your way with pureeing all of the strawberries. Glad you've been enjoying it :) Great photos, love the styling.